Are those 1999 or 9999 digit units? You mean counts, not digits. Digits means the number of places, e.g. 9999 counts is 4 digits, and 1999 counts is 3.5 digits. Picked up 2 more AVO meters, with their cases! One is a military version (with the NATO stock number). My collection is growing. that Philips PM2421 are 1999 counts. 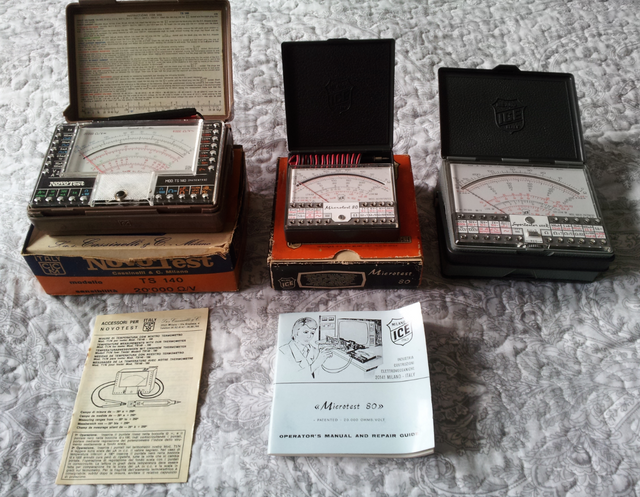 this instrument may be the grandpa of ESR testers, it was at home in the Valvo Manufacturing for capacitors. Yes. Cunts Actually 9999 would be something like 3.98 digits, sales officer would call it 6 digits, since there is sign and radix. I got a new meter and I mean NEW. Heck I have not bought a new meter I think in past 15 years. 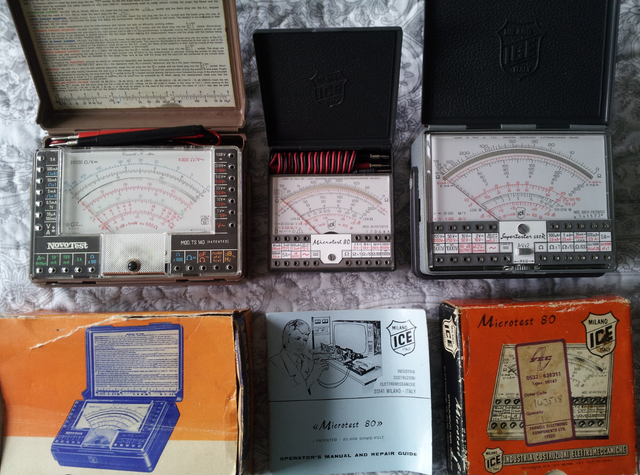 This little and cute meter is second best in the market (in its class), what I did found. The mechanical design is really satisfying and so nice compared to all the rubber bricks mainly floating in the market today. This one is "Made in Japan" unit and not the "$anMa made in hing kung". Sanwa EM7000 a "modern" FET VOM, how I could resist and I didn't. 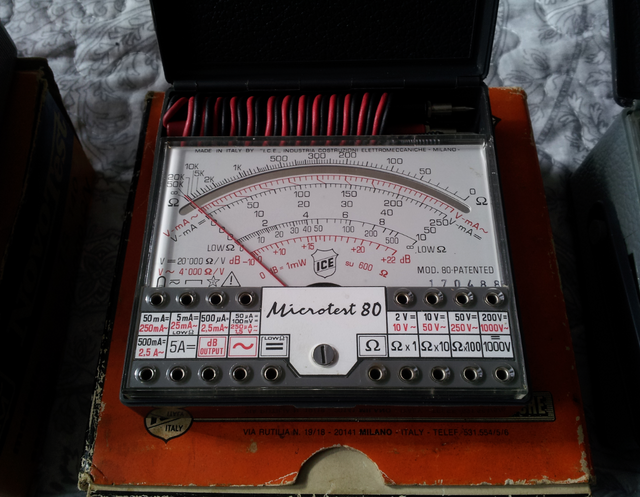 Micronta 18-Range Multitester was given to me by a widow whose late husband was a gas fitter. I think he many used it to test batteries and continuity. Sill boxed with the Radio Shack battery. 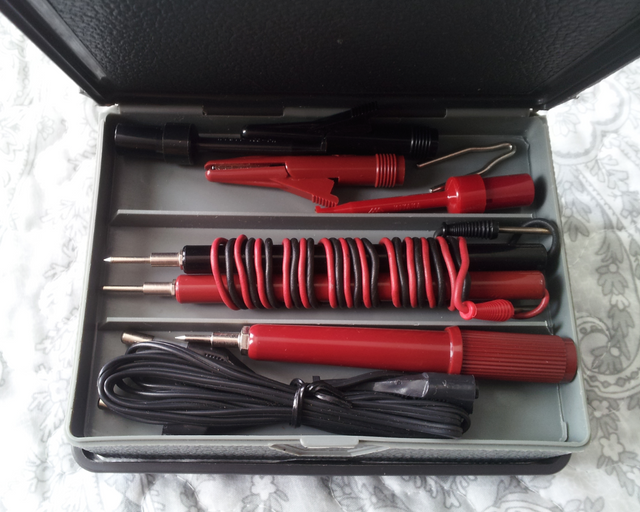 Also a Beckman Industrial 310 with the leather case which I used at work and they allowed me to keep it when I decided to leave for to join another company. It was a goodbye gift. To Build a Cenotaph, First Choose a Million Victims. 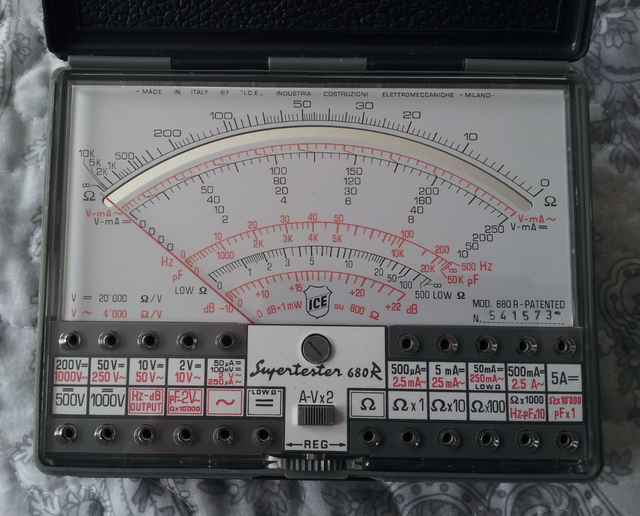 Ice Supertester 680R, if you don't have one of these then get one, Brilliant analogue meter, which is still in production. With all the leads and connectors. With the Cassinelli milano Novotest TS-140 for comparison, these are made by different companies, Cassinelli is no more i believe. Hey could you write a review of this one? First meter I have ever used - I recently inherited it from my dad. Quite featured for its time and the very large movement was enjoyable to use. Where can I find it and accessories for sale? A few years ago I had a few websites that advertised it but the links went dead. Free gift with any purchase at HF about a year ago. Yep, handy to have around for low-energy measurements. The built-in battery load tester is nice, too. Hey SullyRD, do you have a source for the banana plugs? They seem to be of a rather odd size. I scored a Chinaglia Cortina a while ago on a flea market, but no probes came with it and I haven't been able to find them in the right size. They seem to be of the same size as the Novotest/ICE. Are they 3mm? Sadly also the power supply to make the square wave generator in it work also didn't come with the unit, but that should be easy to fix. If you need only the plugs, they have standard 2.0 mm plugs. I bought some from Distrelec, or you can search on Ebay. 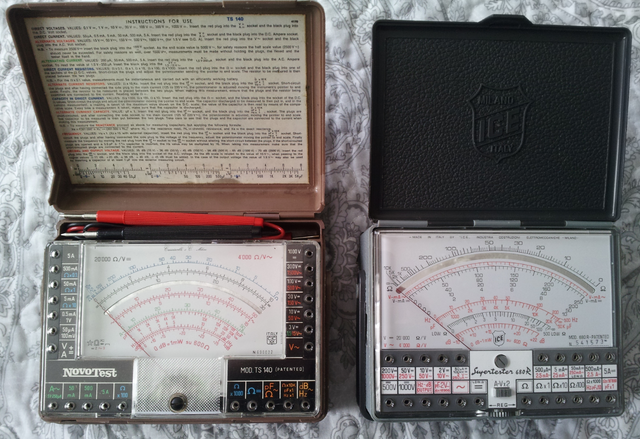 I've got one of those ICE 680R multimeters since mid '70s and it is still in perfect use despite the obsolete and odd 3V battery (2R10). This is a very fine instrument. FWIW, Probemaster offers 2mm connectors for meters such as this (8043S = 2mm meter ends). They ship internationally as well (no, I'm not some sort of paid shill; just a customer). I have some 2mm banana plugs, but they're too small for the Chinaglia Cortina. 4mm is too large. I guess they're not the same as the NovoTest/ICE after all then... Thanks anyway. Thanks for the info on the leads of the ICE; I forgot about some probes I had purchased from Alibaba a while ago and the 2mm ends work really well with this meter. Hi have a 7150 but the front panel says Weston. I used to work at Schlumberger in a division that used to be Fairchild and there was all kinds of old test equipment there because this was the test equipment division. Anyway I never thought much about this meter until it started acting flaky and I found the threads about replacing the input line filter and some other improvements.